It was in one of my last years of secondary school that I visited the national film and sound archive in Canberra, Australia. Amongst the movie posters and photos of musicians I saw something that I found utterly mesmerising. It was an Edison Phonograph with a shattered black cylinder attached to it. “This is what happens when you don’t preserve our history correctly” The tour guide told us. To this point I had never heard of, or seen a wax cylinder recording. At the time I was experimenting a lot with electronic music on my computer at home, with software that now would seem arcane. Later, I would use the passion that I gained from the museum that day to work in Theatre, film and music – or at least until it came obvious that I needed to get more stable work that could feed me. But the image of the crumbled wax cylinder never left me, and I’ve always been fascinated by them. Wax cylinders, unlike what we know of modern music, is completely live. 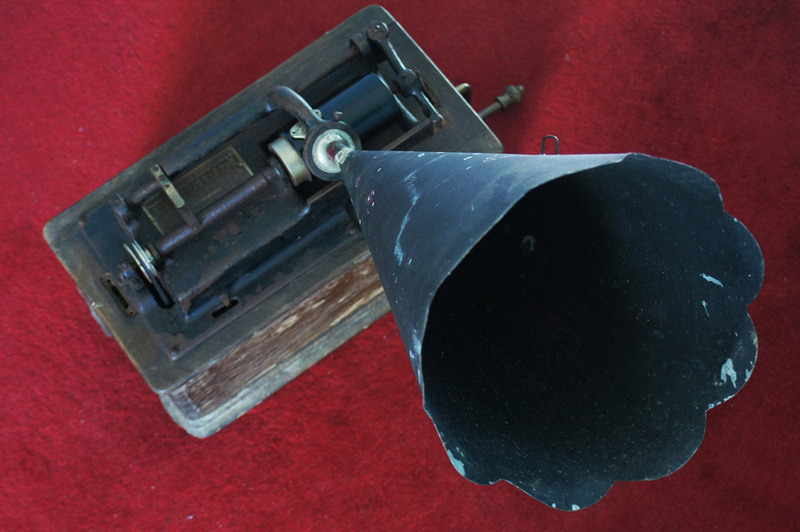 It isn’t remixed or even sent through wires from a microphone to a recording source, but rather performed straight into the cone of a recording phonograph – where it is immediately translated to a stylus that gouged the sound into the cylinder. For about 16 or so years now, I’ve grabbed hold of as many of these wax cylinder recordings as I could. I have a small collection of them, and they stay displayed next to my telephones in the display case next to my desk. However, I’ve never had a player. In those 15 years I have only come across 4 of them out in the wild here in Australia, and the starting price for them – even some really banged up ones, was $1500. I’ve seen only a handful of others as well, all of which were tucked away in corners of museums. In total, I’ve probably seen 9 – with only 6 of them carrying the expensive crystal in the stylus needed to play the recordings. Yesterday Ms Jane and I went with a friend of ours, Michael, to check out the Ipswich Antiques and Collectables Fair. This was the same fair that I went to a few months ago, where I engaged in a morning of typewriter spotting in searing heat before being so cooked in the hot shed that I was motivated to buy a beautiful old fan that I found hidden under a table. This time around I only spotted one typewriter :- a case-less Remington Quiet-riter that had seen better days, which was selling for $35. Naturally as I already had one of these I passed up on it. I did a few rounds of the fair and found pretty much nothing of interest, and just followed Michael about for a bit while he looked for items that would match his 50’s-70’s moderne decor. As I did, I stumbled across a box of wax cylinders that was perched dangerously on the edge of a table, waiting to fall off. The whole box was on offer at a great price, and quickly I whipped out my wallet and gave the chap a smallish note for the lot of them. I’d never purchased these things for such a cheap price, ever! I checked over all the cylinders before I bought them though, just in case a few of them had exploded into a pile of wax-dust by being dropped. They were all intact, but a bit mouldy and would need a but if a clean. But that’s something that I can achieve. The guy was selling old 1930’s and 40’s restored record players, along with the records. As such he was garnering an awful lot of attention from market ‘Have-a-chats’. I made my purchase and stepped quickly away from the chaos, but looked back to try and find Ms Jane. It was then that I spotted something under the table. The guy had a few of his other record players stored there to put up on the table to fill the gap the moment he sold something, and sitting amongst them was a beaten and scratchy wooden box that looked quite neglected but strangely familiar. 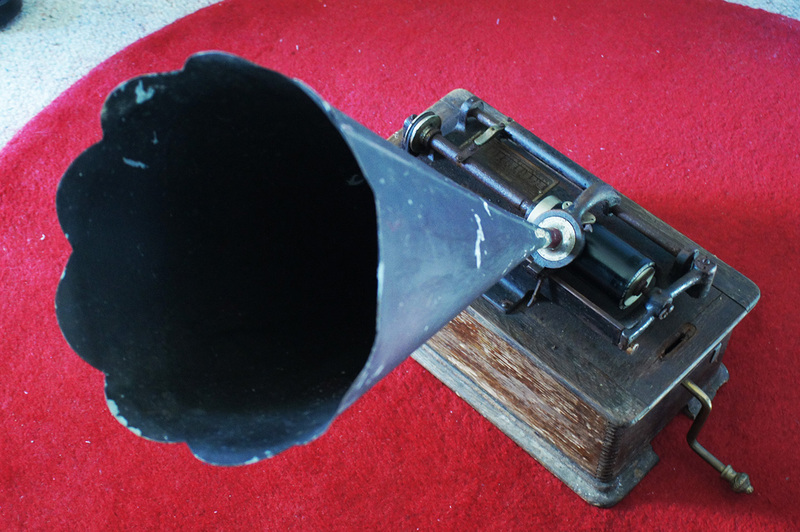 It was an Edison ‘home’ Phonograph, with a rather scratched and inglorious looking early metal horn. I had a little discussion with the owner, and an inspection of the machine where I discovered that the Stylus crystal was still in place, and the reproducer was largely in working condition. The price was more than right, and by the end of the morning the Phonograph was in the boot of my car. The phonograph is complete, but not in working condition. I spent a bit the evening after buying it inspecting it, and just generally trying to figure out how it works. I managed to crank the cylinder by hand, and was surprised when I heard a bit of sound crackling from its cone. I took some video and put it up on facebook, where it unfortunately is difficult share through Blogger. Like typewriters, these are prone to a case of ‘metal cancer’, and this machine has clearly been exposed to a bit of water. But oddly it isn’t all that far off from being operational. However there are two components which will probably need to be replaced – the advance shaft (a screw threaded shaft that drives the reproducer and stylus along), which is probably rusted beyond recovery, and the mainspring – which appears to be not functioning. That said, I have yet to extract the mainspring to inspect it. Can I just say… Holy cow! The mainspring is huge. Think of the biggest drum you have seen on a typewriter, and increase the width by at least 5 times. It must have some serious kick! That said, I may get inside of it and just simply find a tiny little spring encased oddly in a huge drum. The big question is: Do I want to actually restore it? The cylinders themselves actually break-down progressively the more you play them, so I’m not actually in a hurry to do so. There’s nothing wrong with keeping this as a display piece, and keeping the cylinders safe and preserved. At the same time, I want to listen to these echoes of the past – and the ‘restorer’ in me wants to see it working, just like my Typewriters. Could you imagine this on display next to my Oliver 5? Consensus around me seems to be 50/50, with people either having the view that I should preserve the history of the machine, and what every scar and nook holds – against the excitement of making one of these usable. But what a project! I get excited by this thing just seeing it sitting in a box on the floor. The lid of it is in a bit of a dismantled state, and needs serious work – which if anything would be the first repair I do. And I can just see the lid poking out of the box right next to my desk, which gets me enthused every time I see it. The phonograph wasn’t my only purchase for the day at the antique fair. 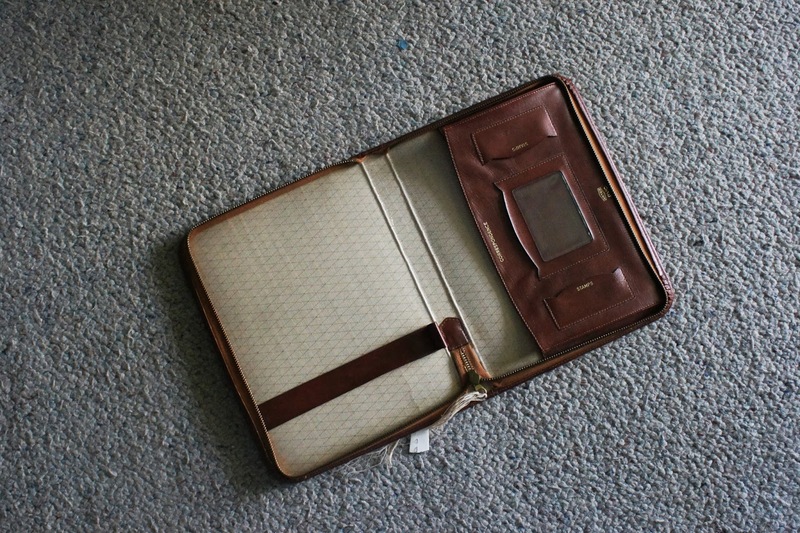 I also grabbed hold of a beautiful little writing folio that is perfect for me to pack in with one of my traveller typewriters when I’m away from home. At a whopping $8, I’d bought it before I could even think about it. 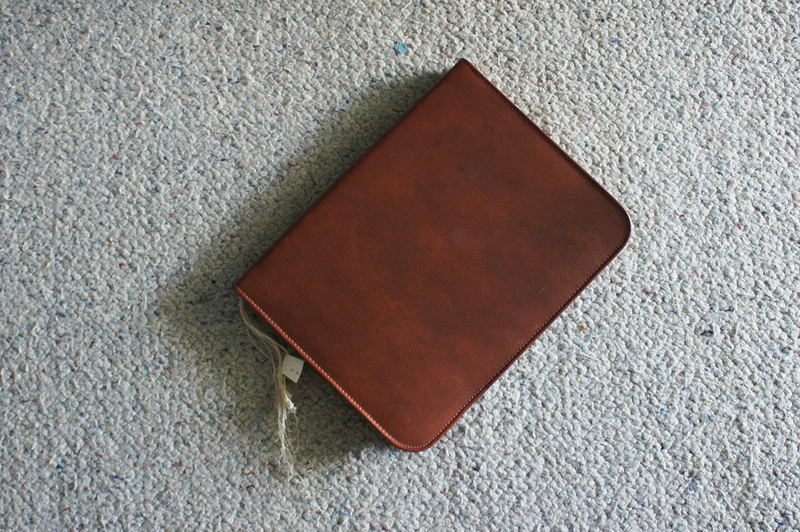 It has space to hold a pen, a writing pad, two lots of stamps (overseas and local?) and a pouch which I would use to hold both envelopes and other people’s letters. All about the size of an iPad. Actually, it almost seemed like it was made to hold my iPad in it, as it fit snugly in the pouch when I gave it a try. The design however is at least 40 years old. 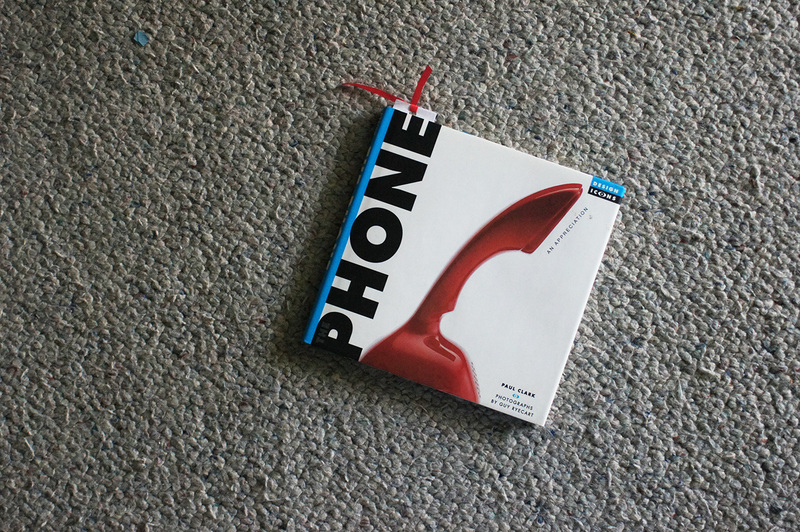 Also, another little find that cost me just a few dollars was a great little book to compliment my other collection: my telephones. There’s a few other books in this series, including ‘The Kettle’, ‘The Radio’, ‘The Teapot’ ‘The chair’ and ‘The Watch’. The seller didn’t have the whole series, and I feel that it is a bit of an oversight that there isn’t a ‘The Typewriter’ book, but I guess not everyone shares the passion for the design of typewriters that many of us do. Mind you, Rob Messenger’s ‘101 great typewriters‘ book, is much better than any ‘The Typewriter’ book would have been anyway. So that was my haul from Ipswich. However, on the way home we detoured down towards the Gold Coast slightly, to collect a typewriter from the Gold Coast hinterland – the beautiful mountainside that surrounds Australia’s bogan mecca city (Gold Coast), which is an astonishingly green contrast to the concrete and glassy glamor of the city that it neighbours. The owner of the typewriter had moved to England, and had been left in her Mother’s shed. She had originally bought the typewriter after playing with her mother’s one, but clearly the Olivetti Studio 44 was too heavy and too large for her to take overseas. The house that I collected it from was amazing. It had a wonderful garden that was the playground to a kennel of dogs, and it was surrounded by acreage that the owner grew their own sheep and goats on. They had essentially created a ‘sustainable’ existence there, producing their own fruit and vegetables, as well as meat. I was hardly surprised to hear that there was another typewriter hiding out inside amidst all of this. The typewriter looked a bit of a wreck, but it is in-fact in pretty good condition. One thing I have learned with the Olivettis is; don’t assume what you are looking at is rust. The paintwork on the Olivetti’s tends to hold and often be home to a kind of mould that often looks like rust-spots, as is the case on this typewriter. A little while ago I cleaned up a ‘rusty’ looking Lettera 32, to find the paint which looked battered and broken, was in fact in perfect condition. 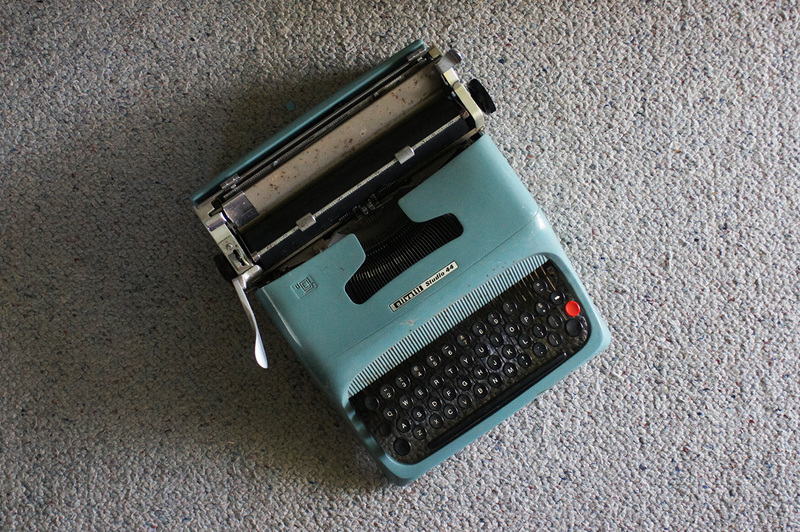 The typewriter now resides at friends place, and actually looks rather out-of-the-box new. Let’s see what can happen with this Olivetti. It is mechanically sound, but a bit glued up. August 18, 2013 in antiques, book, collectables, fair, folio, Ipwich, Phonograph, telephone, typewriter, wax cylinder..
Typing in the museum. Let them free! ← A happy accident, and a silly accident. Wow, great finds, especially the wax cylinders and player! That's what I am leaning towards. I can get hold of some great recording equipment which I could use with this setup, in the hope of rescuing the recordings for future use. There's a website where people have recovered old recordings and uploaded them for everyone to hear. Being that most of these recordings are over 100 years old, there isn't a problem with copyright. Yeah, That's a conversation I had with an engineering friend of mine some time ago. It is actually quite possible to achieve this. I think you're right. Ideally I'll find second-hand parts from the same type of machine – that way, I at least keep it authentic. Sounds like a big restoration job, Scott. And that folio is shweeet! Fred Woodworth writes of the special psychic bond one has with the craftsman of an earlier age, when working with a machine that has kinetic energy stored in its spring- energy put there by the now-gone worker and stored over the decades in the spring. I imagine this phenomenon is only heightened if you were to also hear sounds recorded by some individual from long ago. The gramophone is quite a find, it would be great if you could get it to work. Yeah, and perfect timing too… as it will be coming to Melbourne with me. That's a wonderful way of seeing it. I'm often very conscious of the hands that would have handled these machines in construction, and in later years. And to be honest… I'm itching to hear a solid sound from over a 100 years ago come from its horn. Unfortunately the crank and the player aren't directly connected. Moving it by hand, I can't keep up enough speed to get much out of it. There's a cylinder that has melted against the mandrel, and I've been using that to play. But even then the track advance still needs serious repair. Well, I've seen two now! And you have to remember, I live in a warm semi-tropical environment with high humidity that is perfect for this kind of growth. there seems to a bit of mix and match with some of the cover plates in different colours.